As expected from a Ferrari, the engine is very powerful. A V12, 6.3L that puts 740 Horse Power at 8k+ RPM! These are a lot of horses for a stock car. This monstrosity can do 0-60 in 3 seconds and 0-120 in just 8.5 seconds! This is how fast my car does 0-60. I do not want to talk about this car's engine only but you have a chance to check videos about this car, tune your years and listen to the astounding powerful sound of its engine. I could hear that acceleration all day long... except that would give me a massive headache. As mentioned, the car is very expensive and only a select group of people can afford it. 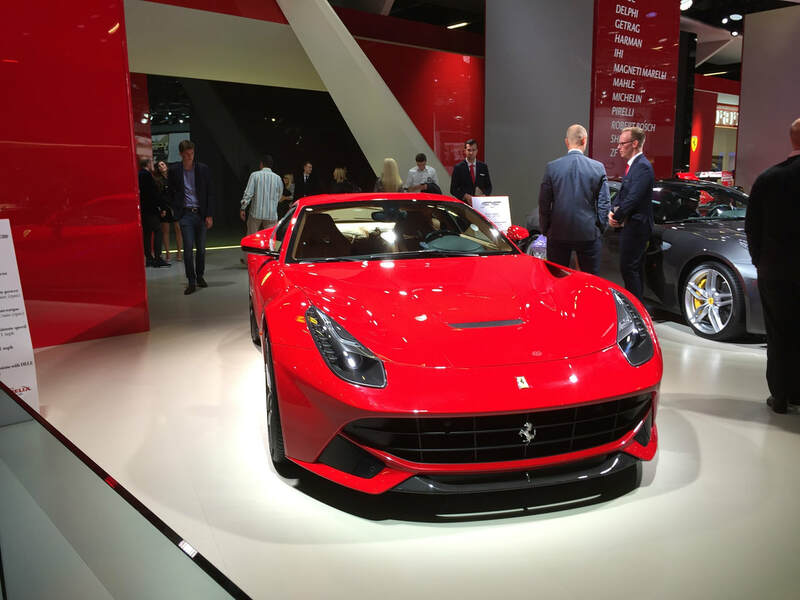 Well, there is another version of the same car, the F12 TDF. 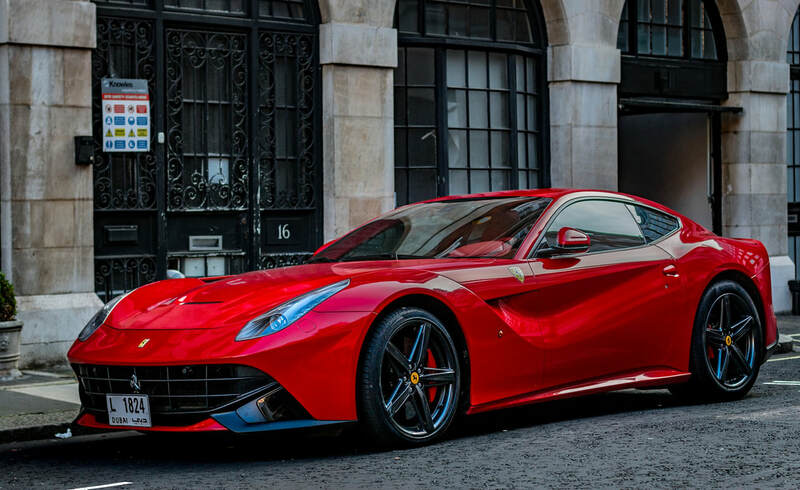 I don't know what TDF stands for but the car has 30-40 HP more than the F12 and does 0-60 in 2.9 seconds. It also costs a lot more. Look at the picture above! Look at the lines, the brake pads, the robust yet refined 20 inch wheels. Man, I love this car! I am not sure what I am trying to accomplish here. I think the picture of the car speaks for itself. I don't expect my writing to make you like the car but I hope I can influence you to do a research on the internet and look for more details on this particular vehicle. There are plenty of videos and auto reviews out there. It is worth looking into. Enjoy the pictures and just so you know, they can be shared and copied if you want. Well, this is my first post as a blogger and there is so much I have to talk about. I have been in love with cars since I was little. My dad was a mechanic and I grew up "helping" him. I am not sure how much of a help I was because most of the time my dad was trying to keep me out of trouble. If I got hurt while playing with his tools, he would hear from my mom... And she talks and talks... Anyway, I always loved being around cars. Hearing their engines, trying to figure out which one was faster - mostly by the looks of the car - because I do not know much about engines and I did not become a mechanic either. I became an Electrical Engineer but my passion for cars never faded away. I like old school classics and muscle cars in general. I do love newer cars too like the famous Nissan Skyline (GTR) or Hyper cars like the Koenigsegg Agera RS or the Bugatti Chiron. Among all these great cars there are the incredible Italian Cars. I am talking about Lambo's and Ferrari's! So, I created this blog to share my passion for these cars. Maybe you identify with me and love these cars too so I would be happy to read your comments should you have any. I live in Utah and a good friend of mine also loves cars. He in fact chose to work on cars for his career. He is a great mechanic and loves cars just as much as I do. He performs all kinds of auto repair and the cool thing about what he does is that he will go to your vehicle and fix it on the spot (when possible). If you ever come by Utah and need help with your vehicle, please talk to my friend! If you say you found him through the blog, he will give you a 50% off! Moving on, I hope you all come back here next week to read my thoughts about the Ferrari 458 Spider. Along with that nice pics (I got them already so the pics will be nice!). See you next week! I have been in love with cars for my entire life! I want to share this passion with you all.